Boulder is closing out summer with FUN! August in Boulder means it’s time for the Boulder County Fair, the Aerial Dance Festival, Firefly’s Handmade Market, the Lafayette Peach Festival, Boulder Fringe Festival, Rocky Mountain Folks Festival and BrazilFest, in addition to summer concerts, movies at the park, kids activities and so much more. All happening in the Boulder area! From oldies to alternative and everything in between, Bands on the Bricks is Boulder County’s premier outdoor summer concert series taking place in the heart of the city on the bricks of the one-and-only Pearl Street Mall. A not-to-be-missed summer tradition with 10 weeks of free concerts. Enjoy performances from the best local musicians along the front range while dancing under the stars. Featuring an outdoor beer/wine/margarita garden starting at 5:30 p.m. every Wednesday night, featuring Rio Margaritas and a local brewery. Bands on the Bricks August Schedule: August 1 – The Country Music Project, August 8 – That Eighties Band. Bands on the Bricks is held on Pearl Street in Downtown Boulder. Beer Garden opens at 5:30 PM, Opening Act starts at 6:00 PM, Headlining Act starts at 7:00 PM. Admission is FREE. Frequent Flyers’ Aerial Dance Festival is an opportunity for people from all walks of life to experience the joy of dancing in the air, for beginners through advanced aerial dancers. This 2-week immersion provides classes, lectures/demonstrations, informal discussions, networking, and performances. For all the information, click here. The Aerial Dance Festival is held in multiple locations. Check the schedule here for prices, dates and times. Colorado Shakespeare Festival is held at Mary Rippon Outdoor Theatre, University Theatre. Times vary, check schedule here. Starts at $20. Tickets available here. The First Friday Art Walk is held in North Boulder along Broadway from Pine Street to Highway 36 (Follow the polka dots and pink flags.) The event is FREE. Rocky Mountain Metropolitan Airport is located at 11755 Airport Way, Broomfield, CO 80021. This event is FREE. Meadow Music is located at Chautauqua Green, Baseline Rd & 9th Street, Boulder, CO 80302. The concert runs from 5:30 – 7PM. Admission is FREE. Live entertainment at beautiful Chautauqua Park will be happening all summer long! Chautauqua 2018 Summer Concert series is presenting a variety of comedians and musicians. 2018 Summer Concert Series August Line Up: August 6 – The Weepies, August 7 – Bruce Hornsby & the Noisemakers, August 10 & 11 – Andrew Bird, August 14 – The Gipsy Kings, August 22 – Ziggy Marley, August 26 – Mandolin Orange. Chautauqua Auditorium, 900 Baseline Rd, Boulder, Colorado 80302. Full schedule here. Ticket prices vary, see prices here. Celebrating its 149th year, the Boulder County Fair, located at the Boulder County Fairgrounds in Longmont, is the longest running county fair in Colorado. The Boulder County Fair offers an entertaining and educational experience for the whole family with fun-filled events and activities like a petting zoo, carnival rides and games, food, music, demo derby and rodeos. For more information and complete schedule, click here. The Boulder County Fair is held at the Boulder County Fairgrounds, 9595 Nelson Rd, Longmont, CO 80501. The Boulder County Fair is FREE. Colorado Music Festival is held at Chautauqua Auditorium, 900 Baseline Rd, Boulder, Colorado 80302. For the full schedule here. Cost is $12.00 – $54.00, tickets available here. The Firefly Handmade Summer Market is back in 2018 at a new location! This year, the market will be held in front of the Main Library in Boulder. At the market, view handmade goods from 100+ indie artisans, enjoy live music, art activities, food for purchase at food trucks, and more! Each market is creatively curated to feature returning and new artisans with home goods & décor, jewelry & accessories, adult & children’s fashion, skin care, ceramics, art, artisanal food, paper goods, and more. The Firefly Handmade Summer Market is held in front of the Main Library in Boulder, 1001 Arapahoe Ave, Boulder, CO 80302. Admission is FREE. Colorado Brazil Fest is the largest festival of its kind in the Colorado, and also one of the largest in the nation, with 1500-2000 participants each year. Colorado Brazil Fest is hosted by Boulder Samba School, the only organization in the state dedicated to promoting the rich heritage of Brazilian music, dance, and culture, with a track record of engaging thousands of local residents in performances and educational music programs since its inception in 2009. This year’s lineup includes: Bateria Alegria, Ginga, Alessandro Penezzi, Choro das 3, Michele Castro, Bella Diva, Luciana Da Silva, Samba Colorado and Capoeira Canavial. For the full schedule, click here. The Colorado Brazil Fest will be held at a variety of locations throughout the Boulder area. For the full schedule, including locations, click here. Some events are free, while others are ticketed. Click here for all the details. Boulder Dinner Theater is located at 5501 Arapahoe Ave, Boulder, CO 80303. Schedule varies, click here to see full schedule. $40 – $67 Tickets here. Once again, Twenty Ninth Street is going to rock, swing and jive with the summer concert series. Join the fun at Twenty Ninth Street’s Central Plaza next to West Elm, where The Barrel is located for food, drinks and dancing under the stars. Music Line-Up: August 3 – Hunter Hamilton Group, August 4 – Crowboy, August 10 – The Catcalls, August 11 – TBD, August 17 – Ashton Lee Band, August 18 – Lunde Station, August 24 – Brian Johnson Duo, August 25 – The Acoustic Mining Company, August 31 – Jon Pickett, September 1 – Papa Juke. Twenty Ninth Street LIVE! Concerts are located at Central Plaza next to West Elm. The concert runs from 6PM – 9PM. Admission is FREE. If you love amazing live music in the open summer air, check out Louisville’s Downtown Street Faire. These Friday nights have everything you need for a fun, fabulous evening including food, adult beverages, live music, and a relaxed atmosphere in lovely downtown Louisville. Music Line-up for August: August 10 – Lee Fields & The Expressions. Street Faire is held in Historic Downtown Louisville at the Steinbaugh Pavilion, 824 Front St, Louisville, CO 80027 from 5PM – 9:30PM Rain or Shine (Music begins at 6:30PM). Admission is FREE. A celebration of Colorado wine in the heart of downtown Estes Park. Enjoy tastings from over 20 Colorado wineries, fresh food, local Colorado vendors and live music. The 4th Annual Estes Park Wine Festival sets up for the weekend in beautiful Bond Park, where festival-goers can soak in the summer sun while enjoying sipping on a variety of locally created wines. From red to white and pink, the Estes Park Wine Festival offers the opportunity to taste and learn about each style of wine and the unique process of how wine is made in Colorado. 21+ event. Estes Park Wine Festival is held at Bond Park, 170 MacGregor Ave, Estes Park, CO 80517. Tickets will be $30 presale, $40 at the gate. Tickets available here. Broomfield will be hosting another Summer Sundays event at the Brunner Farmhouse! And there will be fun, new additions to the events this year. There will be carnival games and prizes, face painting, instrument petting zoo, children’s crafts, storytelling, bouncy house, a North Metro Fire Rescue District fire truck for the kiddos, a Century Chevrolet car for everyone to draw on, a hula hooping contest, and icy treats from Kona Ice of Broomfield and Arvada. We might also have a hula hooping artist and athlete show us some tricks! Then, stay after the festival from 6-8 p.m. for a live concert by Metropolitan Jazz Orchestra and prize giveaways! These events are brought to you by the Broomfield Council on the Arts and Humanities (a local nonprofit organization since 1973). Participating groups with booths include the Broomfield Symphony Orchestra, Broomfield Art Guild, and Broomfield Spellbinders. Erie’s Concerts in the Park will be hosting two concerts in July! On August 4, FACE Vocal Band will perform. On August 18, local Erie bands will perform including Case in Point, Bakersfield, 50 Shades of Blue and Down2Earth. FREE children’s activities. Beer, wine and concessions will be sold. The Boulder Fringe Festival is an eclectic event that allows audiences to enjoy unique “fringe” artists in a variety of Boulder venues at an affordable price. The first ever Fringe festival took place in Edinburgh, Scotland in 1947 when a group of artists who were not mainstream enough to be accepted into a larger festival decided to form a new festival on the “fringes”. Since the original festival, hundreds more have been held around the world. Boulder’s festival is loosely modeled on the original, offering performing artists of every genre, large and small, an opportunity to be a part of the festival. In order to keep the Boulder Fringe Festival as inclusive as possible, the costs for artists to participate are kept low and there is a lottery system in place for picking the 20 performers that make up the festival. Most performances are one hour or less, and are scheduled festival-style, so you can come to one show and stay for one or two more. Tickets for each show are very affordable, allowing audiences from all walks of life to attend. In addition, every dollar made from ticket purchases goes directly back to the artists. For the full schedule, click here. Boulder Fringe Festival will be held in various locations around Boulder. Tickets are $13+. For all the details and to buy tickets, click here. Spend a glorious Colorado summer weekend celebrating songs and stories from around the musical and geographic world along the St. Vrain River at the 28th Rocky Mountain Folks Festival at Lyon’s magical Planet Bluegrass Ranch. The “summit on the song” welcomes our favorite songwriters from folk, rock, country, indie and more including Dave Rawlings Machine, Gregory Alan Isakov, The Revivalists, Lake Street Dive, Elephant Revival, Josh Ritter, Rhiannon Giddens and so many more! Full lineup can be found here. Numerous camping options nearby include: on-site at the festival grounds, along the St. Vrain at the new River Bend Campground (across the street from the Ranch), or under the cliffs at Meadow Park (an easy five-minute walk to the festival). This family-friendly festival is FREE for kids under 12, with a whole host of activities: Tube the St. Vrain River through Planet Bluegrass. Paint, sculpt and assemble in the arts & crafts tent. Build sand castles on the beach. Join the variety of fun, planet-minded activities throughout the day including slacklining, tree climbing, nature studies, a kids music performance, an instrument petting zoo, and much more. Don’t miss the 5th Annual Boulder Craft Beer Festival, bringing together the best craft breweries and a handful of local cideries from Boulder County and beyond for a tasting festival, offering attendees samples of the best beer on the Front Range. The festival includes music, lawn games and food for purchase. Attendees will be able to sample beer from more than 30 breweries while enjoying live music from The Sweet Lillies (12:30 – 2:30 pm) and the sultry alt-Americana band Foxfeather (3:00 – 5:00 pm). A number of local food trucks will be participating in the festival with food for purchase onsite at the event. The ShutterBus will be on hand to take free photos with your friends. There will also be free lawn games available for attendees including ping-pong and corn hole. The Boulder Craft Beer Festival will be held at North Boulder Park, 2848 9th St, Boulder, CO 80304. Tickets $35 per person General Admission, The $50 per person VIP ticket. Tickets details available here. The mission of Gelato Festival America is to spread the culture of Artisan Italian Gelato. Born in Florence, Italy, Gelato Festival is an all-star line up where the biggest names in Gelato making compete against one another with a one-time flavor they have created just for the festival. The event gives visitors the opportunity to experience the secrets of high-quality gelato, learn about the production techniques by watching the Artisans at work in the ‘laboratory’, and taste all the competing flavors, voting for their favorite one. The Gelato School is where show cooking demonstrations revolving around the world of gelato take place as well as fun activities for both adults and kids. After four events in 2017, Gelato Festival returns to the US with eight festivals all around the Country: Jersey City, Boulder, Chicago, Washington DC, Los Angeles, Dallas, Scottsdale and Tucson. Artisans and chefs will go through a rigorous selection process in order to compete in one of these eight stages. with a unique, one-time flavor specially created for the Gelato Festival. This event is held on Folsom Field’s Rooftop Terrace, 2400 Colorado Ave, Boulder, CO 80302 from 8AM – 9AM. The class is FREE. The Boulder Adventure Lodge is hosting it’s 3rd Annual Under the Stars Film Series. A free night of live music and outdoor adventure films presented on a 24-foot inflatable projector screen setup on the lawn by Fourmile Creek. Beer and food are available for sale all evening. The Under the Stars adventure films are brought to you by the Adventure Film Festival, offering great door prizes from local sponsors which will benefit the Boulder Climbing Community, a local non-profit. McDevitt Taco Supply will be serving deliciousness on site. Follow it up with the best s’mores of your life provided by the The S’More Pit. So come hungry!!! Biking is highly encouraged! The lodge is located right at the end of the Boulder Creek Path, just 100 ft up Fourmile Canyon. Parking is super limited, $20/car for parking on site if you are not an A-Lodge guest. You can also park at the Elephant Buttress / Dome Rock parking area on Canyon, not at the Justice Center. A free SHUTTLE will be available, giving people rides up the canyon. Call the lodge with questions: 303.444.0882. The Boulder Adventure Lodge is located at Boulder Adventure Lodge, 91 Fourmile Canyon Dr, Boulder, Colorado 80302. The event is FREE. Parking is super limited,$20/car for parking on site if you are not an A-Lodge guest. Emmy Award winner and Grammy Award nominee David Cross is an inventive performer, writer, and producer on stage and screens both big and small. He will be performing a comedy show at Boulder Theater this August! David Cross is performing at the Boulder Theater, 2032 14th St, Boulder, CO 80302. Tickets $39.50+, available here. 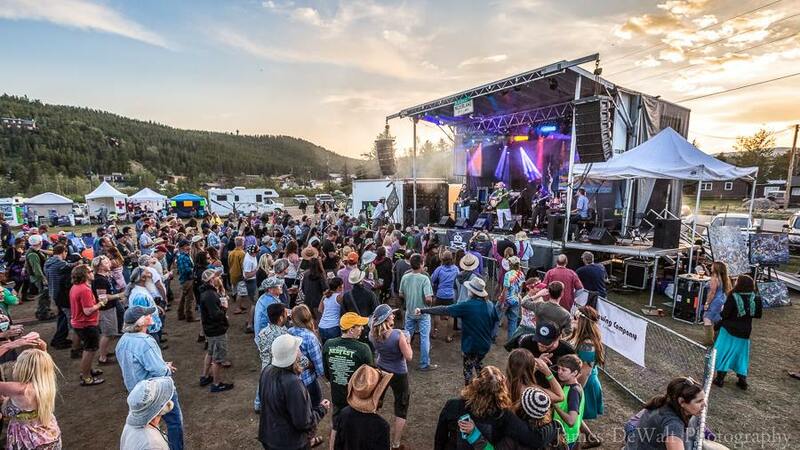 The Nederland Music and Arts Festival is an annual three-day outdoor music and arts festival in the music world’s renowned Nederland, Colorado. Now in its 20th year,NedFest is one of the oldest music festivals in Colorado and one of the older ones in the whole country, too. We host a wide range of music, from rock and roll to blues, bluegrass to folk and Americana, with a hint or two of jazz. Onsite camping is available next to the Barker Reservoir and NedFest is very kid friendly, with kids 12 and under free with an adult, a kids’ tent and activities, and a special teen price too. Artists and craft vendors ring the field. Colorado microbrews and mead are on tap and we always have a variety of food vendors. NedFest is held at 151 East Street, Nederland, CO. Tickets $45+, available here. The 10th Annual Handmade in Colorado Expo is an annual showcase of some of Colorado’s Best Handmade Arts, Crafts, and Goods. All merchandise displayed at this juried show is handmade in Colorado and sold direct by the artist or crafter. A huge collection of exhibitors will represent a wide range of media. All work sold will be created from both emerging and experienced artisans from Colorado. This event is designed for Locavores as customers will only find Colorado made items. Free admission, Live music, and family fun. Experience Great shopping, awesome Live Music, and Live Art at the longest running and best festival exclusive to Colorado artists and crafters! The Handmade in Colorado Expo is held at Bond Park, 170 MacGregor Ave, Estes Park, CO 80517. Admission is FREE. Bring your family, friends, blanket or lawn chair and join the Town of Erie Parks & Recreation Department for movies in the park this summer. On August 25, Cars 3 will be playing! There will be fun themed activities or a craft prior to the start of each movie. Movies will begin at dusk (around 8:30 p.m.) on the Civic Green at the Erie Community Park. Sweet treats will be available for purchase from Kona Ice and Vanilla Bean Pastry Truck. Erie Community Park, 450 Powers St, Erie, CO 80516. Movie starts at dusk (around 8:30PM). Admission is FREE. The Leave No Trace Center for Outdoor Ethics is a national organization that protects the outdoors by teaching and inspiring people to enjoy it responsibly! The Center is bringing No Man’s Land back in order to bring environmental awareness to the Boulder community. We are proud to share with Boulder a selection of short lady-powered adventure films. Featuring the best-loved films from festival archives as well as brand new films that feature the most wild, driven and inspired female adventurers! No Man’s Land Film Festival will be held at Boulder Theater, 2032 14th St, Boulder, CO 80302. Tickets are $15, available here.